It’s become a pretty common thing for me to meet people who are curious about gluten-free eating, and coconut flour. Unfortunately, many coconut curious people have had some bad experiences with their initial coconut flour escapades, and as a result, got turned off immediately. 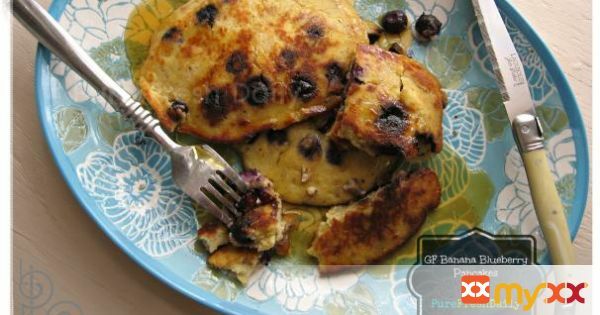 I’m here to share this introductory Gluten-free Banana Blueberry Pancake recipe.A little info: Coconut flour is made from the dried meat of the coconut. It is ground down into what becomes a fiber-loaded flour which makes it dense and dry. Because it is dense, coconut flour loves to be matched up with eggs, purees, and liquids. Check out this recipe, you’ll see what I mean. 1. Beat eggs for 1 minute. Add water, oil and flour. Whisk together until combined. Allow to sit for 5 minutes so coconut flour can absorb and expand. Add baking powder, cinnamon and mashed bananas. Whisk. Gently fold in blueberries with spatula. 2. Heat oil, butter or a combo of both in skillet. Ladle 1/2 cup batter for each pancake, onto skillet. Cook 5 minutes on one side, over medium to low heat. Flip over to cook other side. Repeat steps until 8 pancakes are achieved. Drizzle with maple syrup.